Most of the winning teammates of Pitch Intense from the World Adult Kickball Association gather with their trophy. 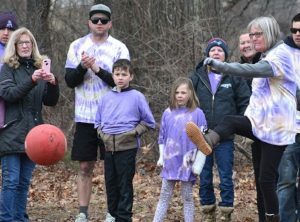 Hudson/Marlborough – Veteran participants of the annual Snowflake Festival Charity Kickball Tournament have experienced various weather conditions, locations and worthy benefiting causes. 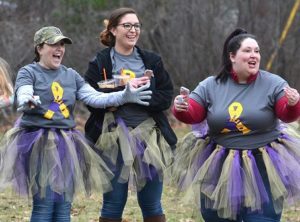 This year’s 17th annual fundraiser took place March 3, the day after a nor’easter without accumulated snowflakes locally. Formerly held at a few sites in Marlborough, the event was moved to the field at Hudson-Concord Elks Lodge 959. Nineteen teams of 10 players needed to only occasionally dodge muddy puddles. A group of volunteers gathers annually to organize the fundraiser for different causes each time. This year’s main beneficiary is the Marlborough family of Layla Krieger, who was diagnosed at 19 months with stage 4 neuroblastoma. 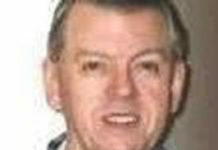 Donations from proceeds also went to another Marlborough resident recently diagnosed with cancer, and the Jonathan Dutchka Memorial Scholarship Fund. 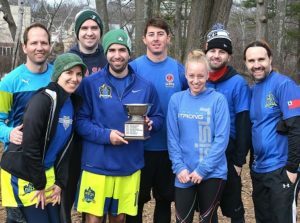 The tournament concluded with a trophy presented to the same winning team for the second consecutive year, Pitch Intense of the World Adult Kickball Association. Funds were raised with team entry fees and base sponsors. Fundraising continued with raffles at a post-tournament party at the Prospector East Saloon in Marlborough, where its owner Bob Kays donated food. 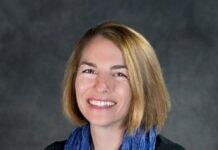 Kim and Joe Otte of Hudson served as event co-chairs. (l to r) Lisa Batista, Tanisha Stevens and Maureen Bonner cheer for the Love for Layla team. Karen Miller (right) kicks the ball while playing with the Hudson AMVEST Post 208 team. 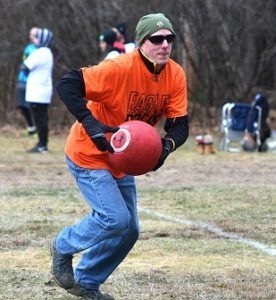 Matt Vogel runs with the ball while playing with the Eagle Riders team. 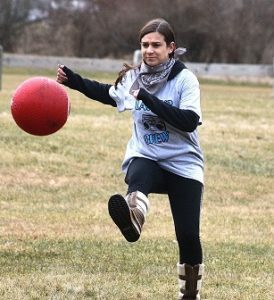 Jessica Schaufus kicks the ball while playing with the Layla’s Crew team. 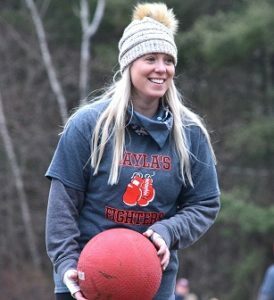 Caylie Andrews plays kickball with the Layla’s Fighters team.